Writing further on the design of the tax system, Casey Mulligan shows evidence indicating that the visibility of taxes does not matter. Now, Professor Mulligan is the smartest guy I have ever met, so when he says something we should probably listen. However in this case I don’t believe the matter is settled. First, notice the way the nominal employee-employer share of payroll taxes are divided in a large percentage of countries (such as the U.S) is 50-50. You pay half, the employer pays half. Seems fair doesn’t it? Economically, this division is silly, since the burden of the tax is completely unrelated to who pays it in. The only thing that matters is incidence. Just the fact that about half of all advanced countries have chosen the 50-50 illusion tells us tax visibility matters, trying to trick workers. More importantly, this odd convention restricts the variation in the explanatory variable, so we don’t get to see what would happen if lots of countries had created the illusion that the employer “pays” everything. 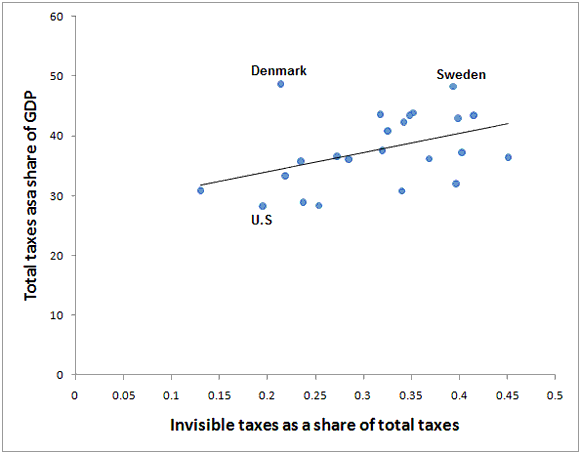 Second, the argument about visibility is about the total tax burden, and this is looking at only one tax. 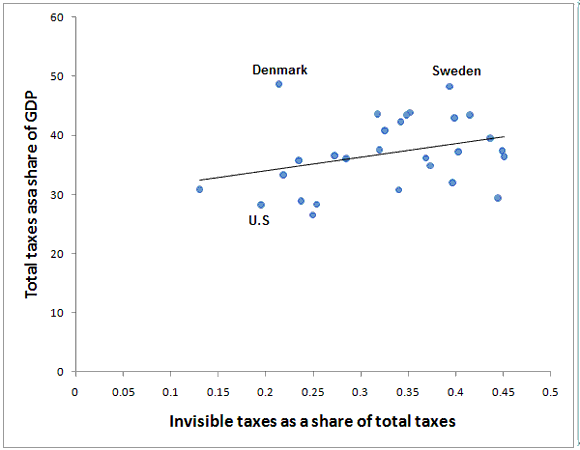 It is quite possible that voters in countries with low visibility of the payroll tax feel they are taxes less, opening the way for other taxes. As invisible taxes I have included all employer taxes, the VAT and sales taxes for 28 OECD countries. I compare this with the total tax burden as a share of GDP. Both variables are for 2007, the latest year with full data (and before the crisis). The relationship is positive, with p value 9.3%. Here is the same graph with only 23 advanced OECD countries. The p value is 4.5%. The coefficient tells us that if tax invisibility increases by 10 percentage points, taxes as a share of GDP go up by 3.2 percentage points, which I consider economically significant. Note that it is possible that the VAT and employer contributions rise with higher total taxes because they are more efficient, not because they are hidden. Still, I find the relationship suggestive. Even trained economists do not take all taxes into account. It is not uncommon for studies of the elasticity of taxable income to ignore consumption taxes. In cases where income taxes have been replaced by a higher VAT this leads to a downward bias for the responsiveness to taxes (the changes in reported income we observe are due to a lower decrease in the tax wedge than the study assumes). Based on years of talking taxes with Swedes, I have a very strong theoretical prior that tax visibility is important. A very common argument is “we pay 30% taxes, and get back so much, so why should we complain about taxes?”. Of course it is possible that we have reverse causality, with Swedes having high tax rates and low attention to taxes due to ideology. They like the welfare state and don’t want to know how much they are taxed. Lastly even if the voters do not know the level of taxes it may be enough for them to know the proposed change, and vote accordingly, to get a efficient outcome. Nevertheless, since there are no economic benefits to hidden taxes, and since hidden taxes MAY lead to systematic bias, the conclusion remains that we should make tax system as transparent as possible. There is no justification for having an “employer” part of the payroll tax.